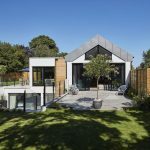 Professor Tom Woolley from Rachel Bevan Architects explains what hempcrete is, how it is mixed and applied, and what the pros and cons of using it are. Tom became interested in environmental issues in the 1980's after doing a lot of work with community groups. In the 90's he worked on producing the “Green Building Handbook” which originally had funding from the Department of the Environment. Feeling later that the Green Building Handbook was a little negative in terms of its critique of conventional materials, they set about researching and producing “Natural Building” – a book documenting English projects that used natural materials. Despite being very principled about sustainable building, Tom declares himself a pragmatist rather than a purist. So when it comes to building with natural materials he thinks it's important to be realistic, with a focus on aiming to reduce the embodied energy. He sees this as being perfectly possible with many natural materials being just as robust and even lasting longer than conventional ones. He says he wouldn't for example condemn someone for using concrete in the foundations of an innovative building. He does however worry about the quality of many of the buildings being built with modern technology, which he doesn't consider to be fit for purpose and may face needing to be demolished much earlier than they ought to be. In terms of the embodied energy, Tom cites a study in Finland which suggests the amount of energy being used in the development and renewal of a large Helsinki suburb using conventional materials and methods is never recovered over time. By using natural materials in construction, there's an immediate reduction in levels of CO² emissions now, not just in future years. The woody core of the hemp plant is chopped into inch long pieces and mixed with a hydraulic lime binder (one part hemp to two parts lime binder), which together with a small amount of water creates hempcrete, a kind of lightweight concrete. Generally you would use plywood boards screwed into the timber frame of the building to create a space in which to contain the hempcrete. The hempcrete is then mixed and shovelled into the space between the boards, and tamped down lightly to fill the shuttering. If done correctly the shuttering can be removed immediately and the process repeated to cast the next section. It is important not to use a permanent shuttering board, as this stops the hempcrete from drying out properly. The hempcrete can be left with a slightly rough finish, but if coated with a lime plaster people have been able to reach Passivhaus standard. Generally Tom’s buildings get down to an airtightness reading of around 3, which he explains as generally being to do with leakage through the windows as his clients aren’t using triple glazing, rather than through the hempcrete wall. Tom explains that the performance of petrochemical foam insulations can be as little as 30-50% of what the manufacturers claim it will achieve. 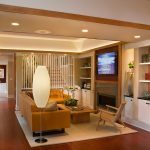 Instead, the people that have been involved with hempcrete have been careful not to over-claim the performance, and generally it has performed far better than has been predicted. The thermal mass properties of the material mean it retains the warmth within the fabric of the building, to a temperature (without heating being used) of around 14-15º – a temperature which is ideal for the food and wine storage industry which is why some have latched on to using hempcrete for their warehouses. 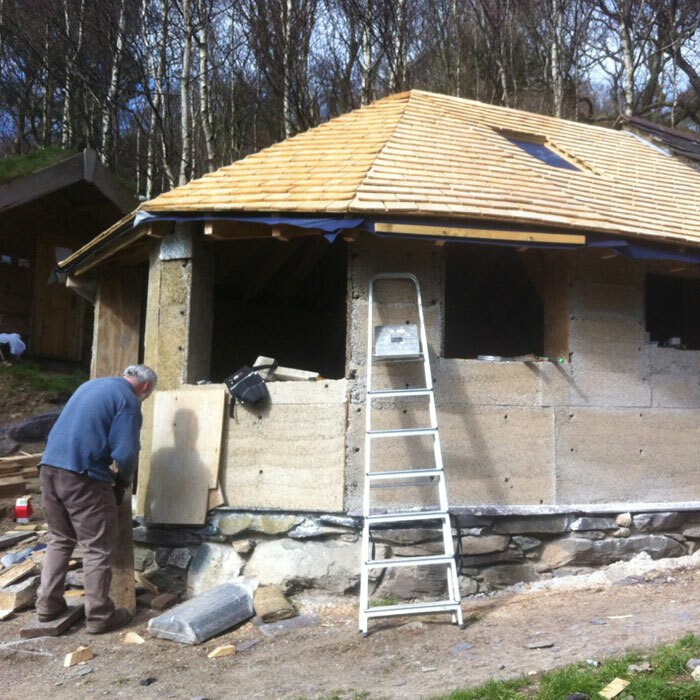 Whereas a more conventional low energy timber frame building would have the timber frame, OSB sheathing board, lightweight insulation material, plastic membranes, external cladding and a plasterboard interior lining, a hempcrete form of construction can use as little as just hempcrete and the timber frame. Tom gives examples of people cutting corners and using a cheaper lime binder which will mean the hempcrete does not dry properly. Also, there is a temptation by many to add too much water – in fact it should be the consistency of apple crumble topping! Casting the hempcrete in temperatures below 8 or 9º should also be avoided as the lime in the mix will not carbonate properly. Hempcrete can be plastered or cast onto old stone or brick walls, which works very effectively. Research on this is currently being undertaken at Coventry University to provide thermal performance data. Download a transcript of the interview with Tom Woolley. I like the process of looking for land, the excitement of exploring new areas and rating each plot against our desires and budget. I heard someone say this before – it's easy to find a bad plot! After six months of trawling websites, scouring potential areas we like and hounding local landowners I felt I should share some of the barriers I've come up against. 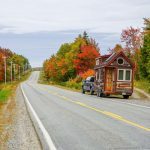 Read my blog Why its So Hard to Find Land to Build a House on. 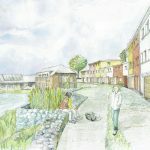 Each year the Passivhaus Trust hosts the UK Passivhaus Awards, which aims to promote the Passivhaus standard in the UK. Check out the complete shortlist of projects that entered the UK Passivhaus Awards 2015. 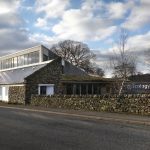 This year there was also a special feature to celebrate the Passivhaus Trust's 5th birthday, looking at the three winning projects from the UK Passivhaus Awards 2012 and examining how they have performed over time. All videos were produced by Regen Media, which specialises in helping green builders promote themselves online.